It’s the holidays and the special Apple fans in your life have their fingers crossed for some new gadgets to unwrap. But you’ve got a problem: The bank account isn’t quite robust enough to pay full price for an iPhone 5 or the latest Mac. What to do? 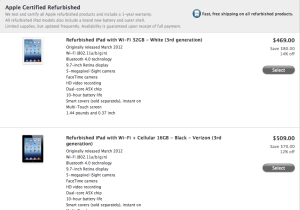 Apple sells good-as-new refurbished products directly. You can actually buy used Macs and iOS devices directly from Apple—and in a condition that’s almost as good as new. The “refurb” category includes both preowned devices and those returned for defects, although Apple says that only “some units” have been returned for technical issues. Before resale, Apple cleans the machine, replaces any defective or substandard parts, reinstalls software that originally shipped with the unit, tests the Mac for quality-control issues, then repackages it with fresh cables and a user’s manual. The company even stamps the machine with a new serial number. 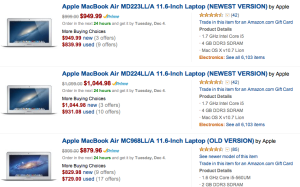 Pros: You get Apple-certified quality machines at a reduced price. (Prices are usually at least ten percent off what you’d pay for a brand-new device.) You even get the free year of AppleCare that you’d get from purchasing a new device. Cons: You’re not going to get the most recent generation of products. For example, there are currently no iPad minis or fourth-generation iPads listed for sale. And the stock waxes and wanes—the 11-inch MacBook Air on sale today might not be available tomorrow. Pros: These guys are proud of their certification; often they’ll try to meet or exceed the service you’d get at an Apple Store—but often, the prices will be cheaper even than what you’ll find in Apple’s refurb stock. (And you can also, if you’re really hurting for money, probably find even older products: These are the places where first-generation iPads are still sold.) For example, in Philadelphia, where I live, Springboard Media offers most used products with a 90-day limited warranty or, in cases of newer-but-used devices, the remainder of the original warranty or AppleCare coverage. Cons: Even more than Apple’s refurb stock, you never know what items will be for sale at independent shops. In fact, with the holidays getting near, you may actually want to wait until after Christmas to buy—when everybody who got an iPad mini under the tree trades in their older device at a discount. Then again, an IOU in the stocking can be a bit of a bummer. 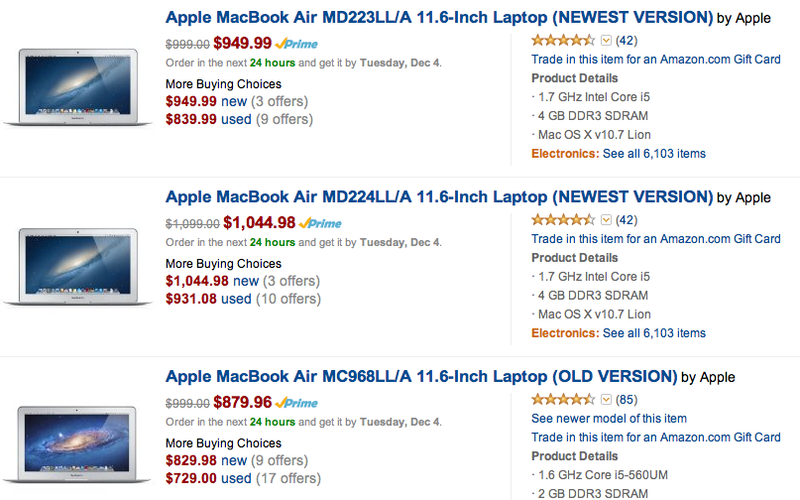 You can buy recent Apple electronics from Amazon—be sure to check the seller rating, though. 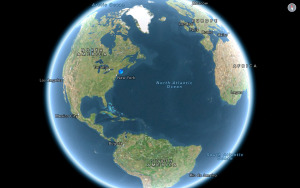 Every time a new iPhone or iPad comes out, we tell you about all the companies looking to buy your old iPhone or iPad. Well, this is why those companies buy those products: To turn around and sell them in the used market. There’s no reason this can’t turn out as a successful option for you—especially if you stick to brand-name companies such as eBay or Amazon, that already have a reputation to uphold and systems for keeping it that way. 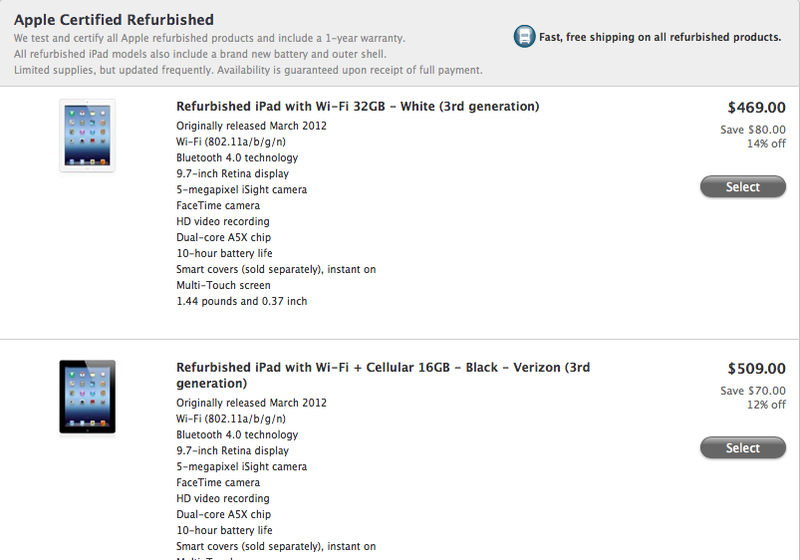 eBay, for example, has a special section on its site just for the sale of Apple Certified refurbished iPads. When you’re looking at the product you want to buy, be sure to carefully examine the seller information in the upper right-hand corner of the page so you know you’re dealing with someone you can trust. Similarly, seller ratings are also available for third parties who sell Apple products through Amazon. Pros: There are enough independent sellers competing against each other—instead of, as is often the case, Apple competing against itself—that you can sometimes find the best-possible combination of price and device quality. Hooray for market competition! Cons: You bear more of the responsibility to ensure you're dealing with a reputable seller. It shouldn't be a problem if you do your research—just make sure you do your research. Frankly, if you were buying for this year’s holiday, this is an option you probably should’ve considered several months ago, so consider this more of a heads-up for next year. And truth be told, not every Apple-selling retailer has a layaway program. Walmart and Best Buy do; Target does not. You’ll generally have to put money down ahead of time—as much as 25 percent of the sale price—then make monthly payments until the device is paid for, after which it’s retrieved from storage and you can give it as a gift. Pros: You don’t need all the money now for your device, and you won’t have to go into debt to get it. You never know if Google will turn up a deal. There are other ways to buy that iPad for cheap this Christmas. There are independent retailers of used devices—both online and off—that don’t have Apple certification or affiliation with a name brand such as eBay: Check with Better Business Bureau before buying from them, however. There’s always Craigslist, but there’s no guarantee that you’ll get a quality machine, much less that you won’t get robbed when you show up with hundreds of dollars in cash to buy an iPad from a stranger. If all else fails, Google the exact product you want: You might be surprised what deals turn up. If none of these options appeal to you, there’s always buying new from Apple itself. If you finance the purchase through Apple, you can—but won’t necessarily—qualify for limited-time interest-free financing on your purchase. That won’t make the iPad mini any cheaper, but parceling out the payment over six months instead of in one lump sum might make it more affordable.